The Swipe and Roll slot machine takes cues from all things 1950s. The look and feel of the game are somewhere between a 1950s diner and the vintage fruit machines you’d find inside. Netent even included a sweet rock ‘n’ roll soundtrack to really give those Americana vibes. Breathes new life into a well-worn slot machine theme. Provided designers such as Netent continue producing games like Swipe and Roll with updated features, it’s unlikely that such classic games with ever truly go out of fashion. Great rock ‘n’ roll soundtrack. It’s a real foot tapper. Not the most exciting game to look at. This is understandable given its classic theme but still, it’s hardly going to win any prizes for the art department. Many will find the theme overly dull when they’re used to playing the high octane, action-themed slot machines that are common these days. Watermelon = 300x the line bet. Orange = 150x the line bet. Blueberry = 80x the line bet. The biggest possible win on the game is a staggering 1,620,000! 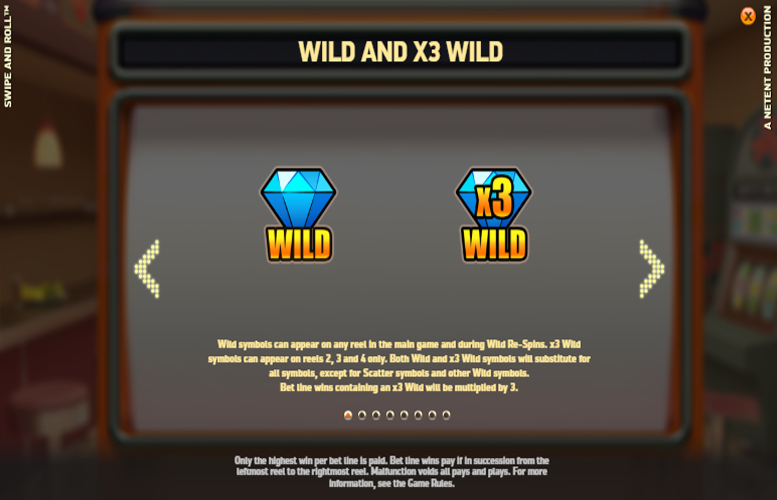 The Swipe and Roll slot machine has two different types of “Wild” symbols. There are regular “Wilds” and 3x “Wilds. The latter award three times the prizes quoted in the pay table when they make up a winning combination. 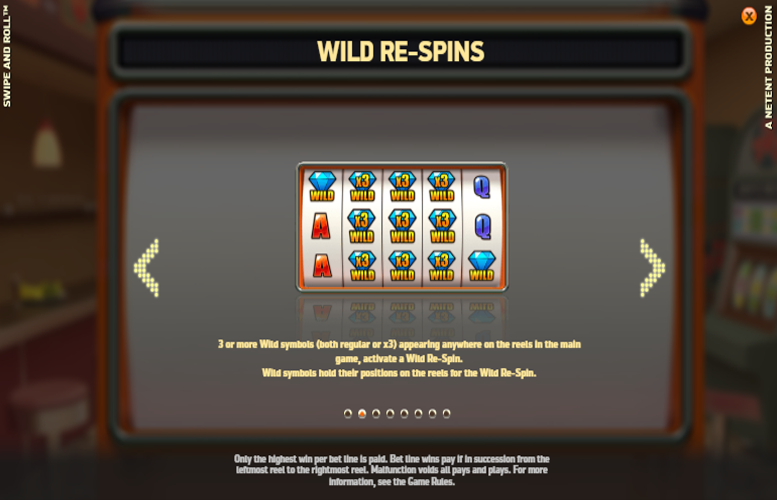 Both symbols can appear on any reel in the main game and during “Wild” Re-Spins. The 3x “Wild” symbols can only appear on reels two, three, or four. Three or more “Wild” symbols (both regular or 3x) appearing anywhere on the reels in the main game will activate a “Wild” Re-Spin. “Wild” symbols hold their positions on the reels for the duration of the “Wild” Re-Spin. 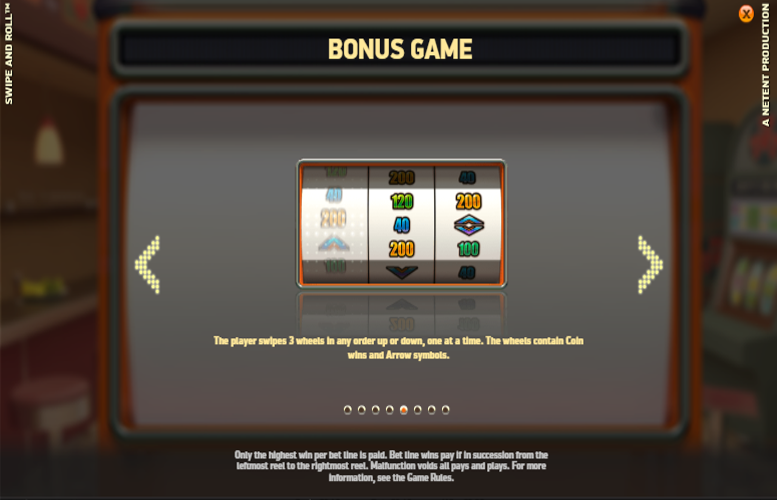 The Coin Wheel Feature is activated randomly during the main game. 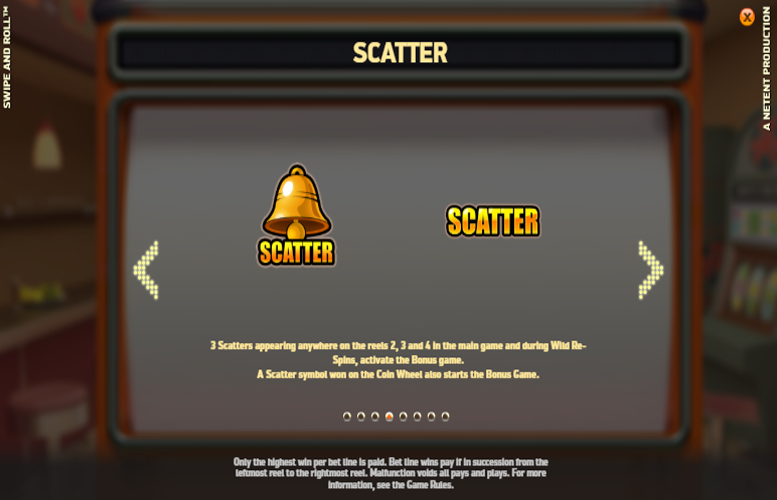 The Coin Wheel contains the following: Coin Wins, a “Scatter” symbol, and Arrow symbols. 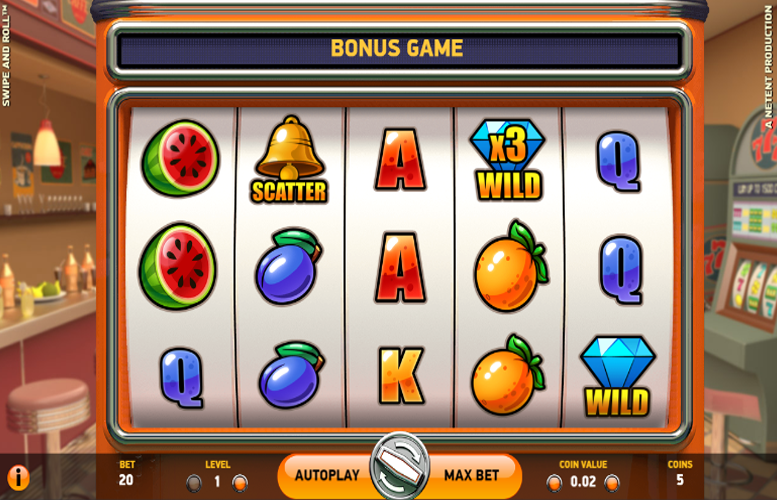 Landing three “Scatters” anywhere on reels two, three, or four during the main game or in “Wild” Re-Spins will activate the Bonus game. Likewise, those won on the Coin Wheel will also trigger the Bonus Game. During the Bonus Game, the player swipes the three wheels they’re presented with in any order either up or down. 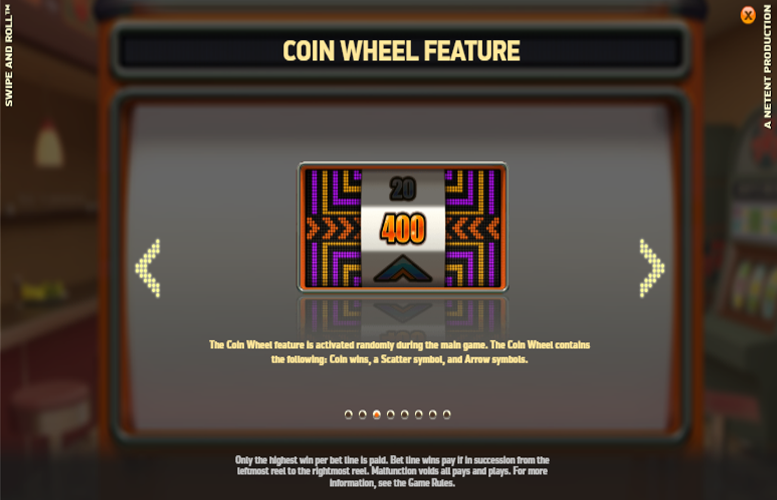 The wheels contain both coin wins and Arrow symbols. King = 25x the line bet. 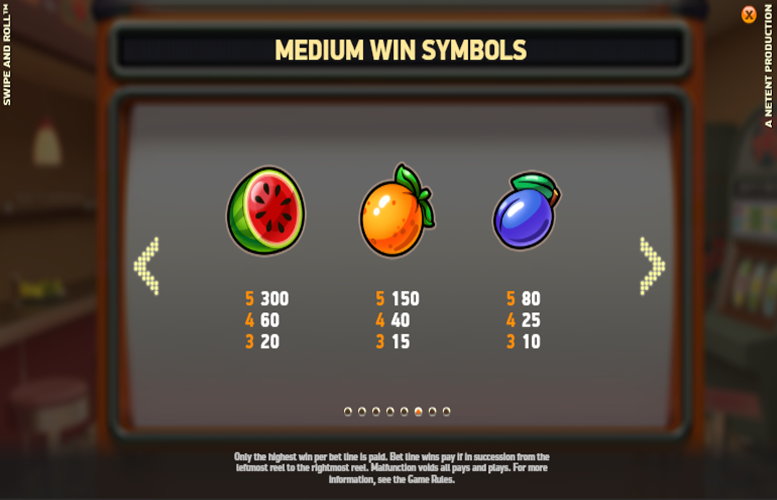 Since the number of win lines is fixed at 20, players are only given the opportunity to adjust the value of each coin, along with the number of them bet on every line. The maximum and minimum number of coins bet is ten and one respectively. Meanwhile, the coin values range between 1p and 50p. This means with all values set to their minimum the lowest possible bet per spin is just 20p. Meanwhile, with everything maxed out, the largest possible bet per spin is £100. This should easily satisfy all but the highest rollers around. All things considered, the Swipe and Roll slot machine is a strong offering for its genre. However, that doesn’t mean it’s a brilliant slot machine. Truth be told, these kinds of games get dull fast. They’re a nice homage to a by gone time but in terms of gameplay and looks, they can’t hold a candle to their modern counterparts. That said, Swipe and Roll does outperform many of its peers of a similar style. It has added some slightly more interesting features than anything you’d find on a real vintage slot machine and we’re sure it’ll win one or two fans for its mix of the old and new. This game has a rating of 3 / 5 with 312 total reviews by the users.